Retirement is a time of potential challenge for couples. While there are many conversations that you (as couples) should be having, perhaps you haven’t thought about how to have them. If that is the case – The Couple’s Retirement Puzzle is for you! 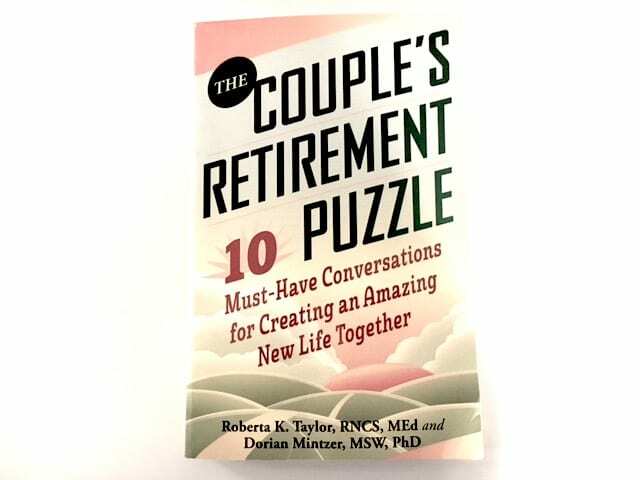 Combining real-life stories with their own personal experiences, the authors offer sound advice and recommendations on some of the most complex problems couples can face when thinking about retirement. Each conversation takes you on a journey of self-discovery individually and with your partner, where you can identify and work on real issues. At the end of each conversation chapter, there are a series of very practical exercises to guide a couple as they discuss these important topics. I particularly liked the way the authors incorporated both individual and couple exercises. By providing this structure, the author’s help couples brainstorm ideas and take action! The authors created an acronym called BLAST representing key rules for talking with each other as couples. (Example: B stands for “Blaming gets in the way”) These are simple yet practical reminders of key behaviors to help make the conversations most meaningful and I recommend making them visible during a conversation as a healthy reminder of a best practice. The last chapter is a compilation of all the conversations and focuses on helping couples create their shared vision and move forward together. Work on communication ground rules and process with your partner, as they are the foundation to any conversation. Form a small group of friends to read and discuss the book and some of these topics together!